A&C Hamiltons Unique Package- Get the benefit of having music on screen and follow the bouncing ball. Packed with professional performance features such as a 6-track sequencer, the DGX630 remains easy to carry and can be battery operated. With over 480 voices and touch response, your playing can be as expressive as on an acoustic instrument. The DGX630 offers a versatile selection of over 400 voices, including incredibly realistic Piano voices, XG voices and new Sweet, Live, Cool and Natural voices. Sweet voices capture the delicate nuances of wind and brass instruments. Live voices accurately reproduce the unique characteristics of acoustic instruments and cool voives the subtlest tones of electronic instruments. .
At first sight these two models may physically look quite similar, but there is an improvement in the basic piano sample, plus there are some great new styles and voices imported from the popular CVP Clavinova series of pianos. The technical spec shows that Yamaha have also managed to double the polyphony to 64 notes, which not only enables more glissando-type sustain effects, but also comes in very handy when youre connected up to Sibelius or Cubase software programs and are playing multi-part compositions. For recording the DGX630 provides USB MIDI and USB to Device facilities, and is capable of bringing up score and lyrics on the screen. And with 160 preset high quality rhythms to play with too, you can rest assured youre not going to get bored! The Yamaha DGX630 is an affordably priced, full length portable keyboard/piano, packed with features and a very authentic grand piano sound and touch. 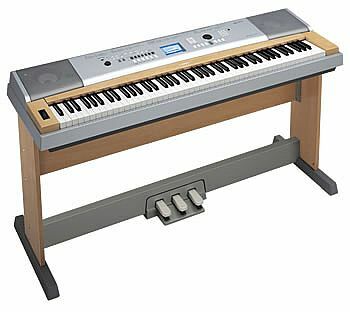 full size keys allow piano-style performance. Touch sensitivity gives added expression. Compatibility allows playback of GM and XG Lite files when connected to a MIDI sequencer. 494 AWM voices (GM and XG Lite compatible) inc.
digitally recorded instruments, using Yamaha's AWM technology for superior sound. 100 Preset Songs (30 Onboard, 70 on CD-Rom) inc. Foot Switch socket - allows connection of an FC4/5 foot switch for sustain.